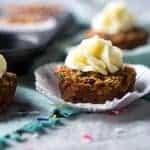 These funfetti baked oatmeal cupcakes are made with Greek yogurt and protein powder for a healthy, portable breakfast that is oil and sugar free! Preheat your oven to 350 degrees and spray amuffin tinwith cooking spray. In a large bowl, whisk together the egg yolk, almond milk, Greek yogurt and vanilla extract until smooth and lump-free. Add in the oatmeal, baking powder, cinnamon, Truvia and sprinkles and stir until well combined. Divide the mixture between 5 muffin cavities, filling just over 3/4 of the way full and baking until a tooth -pick inserted in the center comes out clean, about 30-32 minutes. Let cool in the pan for 15 minutes and then transfer to a cooling rack to cool completely. Once cool, stir together the frosting ingredients and spoon onto the cupcakes! * I haven't tried it, but you could probably use honey, agave, or your sweetener of choice here. Just taste as you add, to desired sweetness. **the more protein powder you use, the thicker the frosting. So, taste as you go until you get the desired taste/texture!